CHENNAI: With 2.51 million deaths in 2015, India has been ranked No. 1 in pollution related deaths, according to a report by The Lancet Commission on pollution and health. China recorded the second highest number of such deaths (1.8 million). India accounted for about 28 per cent of an estimated nine million pollution linked deaths worldwide in 2015. The Lancet Commission on pollution and health is a two-year project in which more than 40 international health and environmental authors led by environmental scientist Philip Landrigan were involved. At 6.5 million premature deaths globally, air pollution was the leading cause of deaths in 2015. Among the world’s 10 most populous countries that year, the largest increase in numbers of pollution related deaths were seen in India and Bangladesh. But the absolute number of air pollution deaths in Bangladesh was only 0.2 million. With 1.58 million, China had the second-highest number of air pollution deaths after India (1.81 million). But the number of water pollution deaths in China was only about 34,000, compared to 0.64 million in the case of India. Nearly 25% of all deaths in India in 2015 were caused by pollution; Pakistan, China, Bangladesh, and Kenya too reported that one in four deaths were caused by pollution. In the case of air pollution, the number of deaths in India from ambient air pollution was 1.09 million, while deaths from household air pollution from solid fuels were 0.97 million. In the case of water pollution, 0.5 million deaths were caused by unsafe water source, while unsafe sanitation caused 0.32 million deaths. 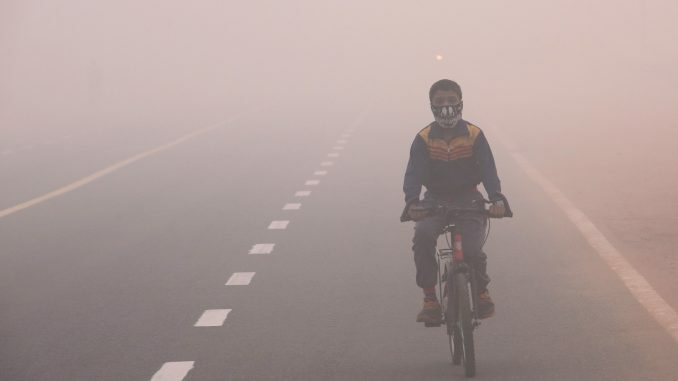 Several cities in India and China recorded average annual concentrations of particulate matter PM2·5 pollution of greater than 100 μg/m³, and more than 50% of global deaths due to ambient air pollution in 2015 occurred in India and China. Deaths from air pollution were a result of diseases such as heart disease, stroke, lung cancer, and chronic obstructive pulmonary disease (COPD). Pollution has been responsible for the most non-communicable disease deaths. “In 2015, all forms of pollution combined were responsible for 21% of all deaths from cardiovascular disease, 26% of deaths due to ischaemic heart disease, 23% due to stroke, 51% to chronic obstructive pulmonary disease, and 43% due to lung cancer,” says the report. “Pollution is responsible for more deaths than a high-sodium diet (4·1 million), obesity (4·0 million), alcohol (2·3 million), road accidents (1·4 million), or child and maternal malnutrition (1·4 million). Pollution was also responsible for three times as many deaths as AIDS, tuberculosis, and malaria combined,” it says.